It's been a busy week here at messcharityrun. First up I finally got back on the horse post Hobart, even though the physio said to take two weeks off. I decided that the ankle was feeling ok and I’d test it out with a vigorous walk. Now I know that’s the sure fired way to exacerbate an injury but after you’ve trained for 6 months or so, and an upcoming 100km trail walk is niggling at your cortex, sitting around waiting to come good really isn’t an option. After 5kms of walking at a 9-10 min per kilometre pace, the usual “ants in my pants” syndrome kicked in and I jogged the last km or so at 6.40 pace. This was total insanity as I had a physio appointment early the next morning so could get treatment if the body did blow up. Good news is I pulled up fine, had a light treatment and am now getting on with things. That translated into another 6.85km vigorous walk/run on Wednesday evening as a warm up to the team trail walk on Friday night. 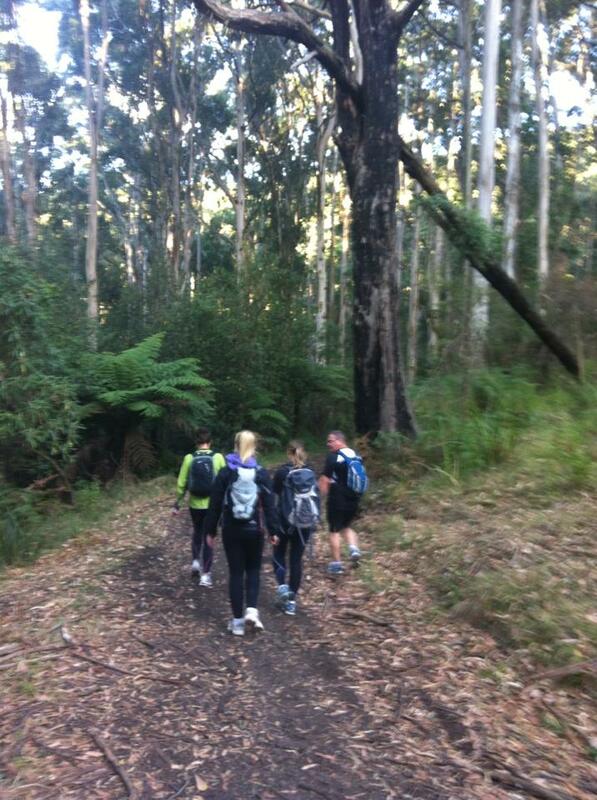 Our first team excursion with backpacks and runners took place on Friday evening (the get together to plan our training, fund raising, support crew etc. over pizza and a few glasses of wine doesn’t really count as an “excursion”). Three of us (one from another team) took the monster train trip into the Dandenongs and were met by two of our other team mates at the bottom of the Kokoda Memorial Walk, more commonly known as the 1,000 steps. This is the start of Section 3 of the Oxfam Trailwalker and is rated the hardest section of the course due to the 1,000 step and the steep hills. Backpacks stocked, trail shoes attached, drink bottles full, we headed off stopping every so often to refer to the map instructions and to take a few happy snaps. Personally I had a great time as I have had months and months of training pretty much on my lonesome for most of the time and it was great to have a few people to banter with and to share a laugh or two. We took 2 hours 46 mins and 17 seconds to cover the 10.52km course, so a tad slow but given about 30 mins was consumed by stops, the fact that it was pretty dark at the end and the 733 metre elevation gain it wasn’t a bad first outing for the team. 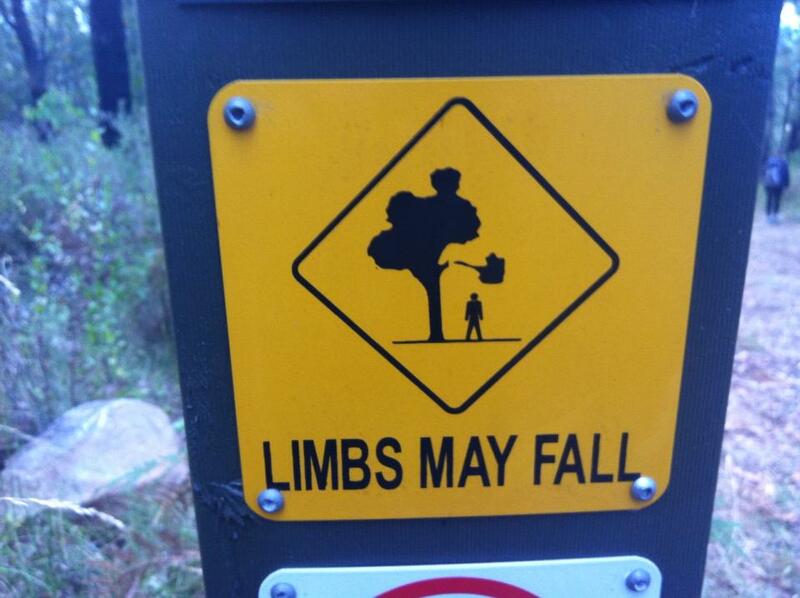 Just watch out for single armed or legged characters wandering the streets of Melbourne, it could well be one of our crew missing the limb. I followed up that late night with a very early rise on Saturday morning to attend the usual parkrun at Albert Park and ran my 2nd fastest official time of 30.09 for the 5kms so was quite happy with that result too. No ankle problems yet so am certainly all good post Hobart Marathon. We have also arranged a fundraising night for 14/3/13, with trivia, games and memorabilia to feature. This night is being held at the Duke of Kent Hotel in Latrobe Street in Melbourne, a special meal deal of $15 for a burger, steak sanga, parma or fish and chips and only $10 entry (if pre booked) and a full bar at bar prices the night is sure to be a huge success. 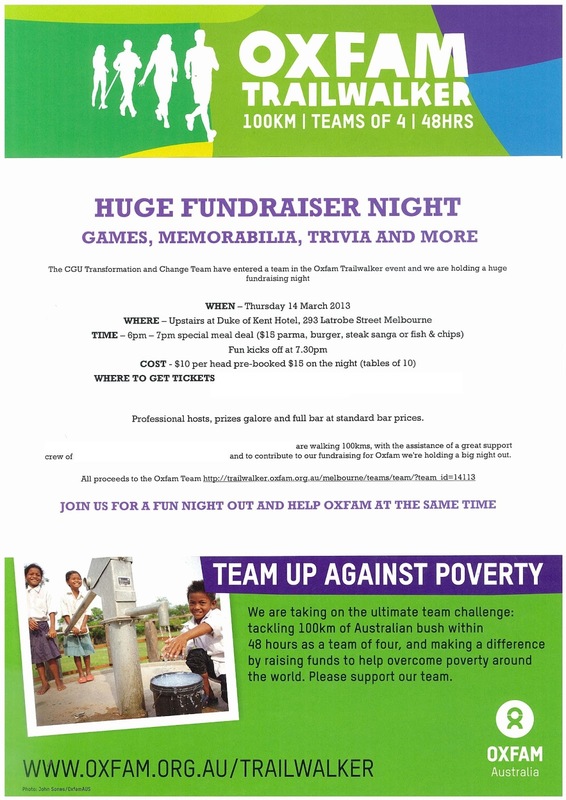 All proceeds will to go to our Trailwalker team. Any Melbourne based readers who would like to attend please leave a comment on the blog with contact details and I’ll get back to you asap. This week will be a little quieter on the organisation front but will consist of some training but nothing back on the trails until 22 February where we are kicking off a 27.7km walk at 9pm to test out our night walking on trails skills.